Please see attached a communication from the Golf Australia Chairman on an amendment to the DSR regulations that will come into effect at 5.00am on Monday 30 January 2017. We would encourage clubs to send a link to this poster to all club members (included for example in a club enewsletter). 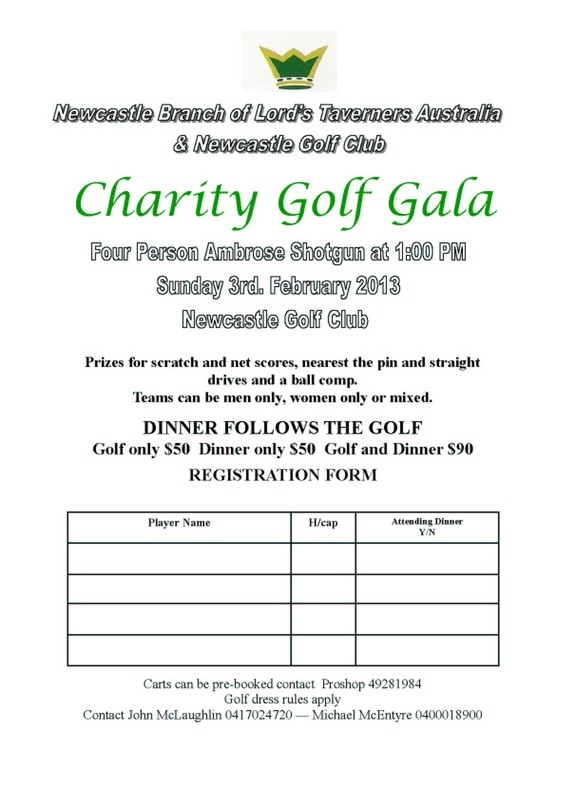 The web page address to use is www.golf.org.au/poster. FOUR alterations to the Rules of Golf by the Royal & Ancient Golf Club (R&A) and the United States Golf Association (USGA) will come into effect in January 2016, including changes to some of the most contentious regulations in the game. The latest edition of the Rules of Golf will keep players from being disqualified if a penalty is discovered after they have signed their scorecards, one of the most often bemoaned penalties particularly at the professional level. As it stands, players who are not aware of a rules violation until after their rounds have been knocked out of the tournament because when the penalty is applied, they are guilty of signing for an incorrect score. Now there is an exception to Rule 6-6d that says a player will not be disqualified for an incorrect scorecard if he was not aware of the rules violation when he signed the card. Instead, the appropriate penalty will be applied to the player's score and he will be allowed to continue in the tournament. In another addition of common sense, if a player's ball moves upon address, the player is now not automatically deemed to be the reason the ball moved and subsequently penalised. The 'Withdrawal of Rule on Moving Ball After Address' means a player will only be penalised one stroke "when the facts show that the player has caused the ball to move". A downgrade in the penalty for a a player using outlawed equipment or artificial devices has also been announced. Now if a player breaches Rule 14-3 (Artificial Devices, Unusual Equipment and Abnormal Use of Equipment), he or she will be penalised two strokes or loss of hole upon the first breach and then disqualified for any subsequent infraction. This is a downgrade from the automatic disqualification upon a first breach that previously existed. The ban on an 'anchored' putting stroke was announced in May 2013, with a two-stroke penalty to be handed to any player who infringes. 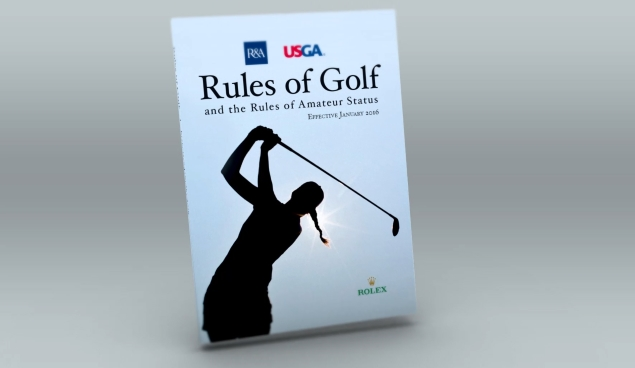 ​The rules are updated every four years by the Royal & Ancient Golf Club and the US Golf Association. This is a follow-up to my 30 April communication to you on the work being done under the leadership of The R&A on pace of play. This work will result in the production of international guidance material that will be of assistance to those clubs or organisations who are affected by the pace of play issue. GA will be represented at this forum and we look forward to contributing as much as we can to it. To best enable us to put all Australian considerations forward in our presentation to The R&A forum we now invite any club or other industry entity to email to us (at simonm@golf.org.au) any submission or thoughts it may have that has been provoked by either the GA report or The R&A report, or by discussion of pace of play generally. Emails must be received by Tuesday 20 October. Please contact me with any queries. I look forward in due course to communicating the international guidance to the Australian golf industry upon its release. please click HERE for the results from Monday's Bass Floor Company sponsored Golf Day at Newcastle Golf Club. The field was comprised of 61 competitors, including 15 sponsors' and members' guests, including 2 from Muirfield GC in Sydney. The players enjoyed an outstanding day for golf ~ mild, sunny, breezy and dry ~ on a course in excellent condition. Scoring however turned out to be difficult, made more so by the wind and the slickness of the greens. A modest 33 point round by Newcastle member Chris Momsen was the standout score of the day, with only a handful of others achieving 30+ points. The luckiest member on the day was Captain Peter who scored the $200 members' name draw jackpot on the third draw. Commiserations go to Geoff Barnett, who left before the draw, and Graeme Thomas who uncharacterisically didn't attend this quality course. It sure pays to play, and to stay, especially given the quality and generous quantity of the finger food which rounded out the AGM after completion of play !!! Thank you Newcastle GC. A reminder that our next event is the BUILDERS -V- ARCHITECTS challenge at Merewether Golf Club. FYI, a draft detailed Agenda can be found HERE, consideration of which before the meeting should enable timely disposition of the issues raised therein. Reports will be tabled as per the agenda, and will also be included in the Minutes of the Meeting. This will save the time in reading them out to the meeting. Questions will be accepted from the floor. to scrutinise the Nomination Forms of the Candidates. to apply the majority provisions of rule 12.
to declare the Election Result. I am writing to update you on two major areas of handicapping work that Golf Australia is currently involved with. We are in the process of performing some scheduled ‘health-checking’ on the handicap and competition results patterns being delivered by the new GA Handicap System now that it has been fully operational for 17 months. Before introducing Slope, Stableford Handicapping, DSR, etc in January 2014 we conducted detailed statistical modelling, and we also trialled DSR for over a year in a diverse range of 20 regional and metropolitan clubs. We were however mindful that the general experience across any field of operation is that pre-implementation modelling is not a genuine substitute for real lived, breathed experience. As a result, an audit was scheduled for when we were in possession of full data across all four seasons. Regular statistical audits are scheduled to occur into the future to ensure the handicap system continues to operate in accordance with industry preferences.The current audit is extensive and is involving analysis of over 20 million scores. We look forward to communicating the findings to clubs in the near future. The R&A and the USGA have for the past few years been leading a project to develop a Worldwide Handicap System. The five other organisations involved in this project are Golf Australia, the European Golf Association (EGA), CONGU (which is the British & Irish handicapping authority), the South African Golf Association, and the Argentine Golf Association. This project has now developed to a point where we believe a worldwide handicap system will be on offer to all countries around the world within the next few years. Whilst there will be no obligation on a country to be involved in the new worldwide system, GA believes that significant benefits can be delivered to world golf by having a single parent body for handicapping. The parent body will be able to provide comprehensive guidance to any national association on the handicapping regulations which will work best to promote and sustain the development of the game in that country's jurisdiction. This service should be particularly beneficial to national associations in the newer golf countries. The choice of regulations will be made strictly from those available within the Worldwide Handicap System menu. Given The R&A's knowledge of the golf culture in the countries affiliated to it, GA believes The R&A has a unique role to play in the leadership of this initiative as it works together with the USGA. The Worldwide Handicap System project has been significantly aided by a statistical research body comprising one member each from the USGA, Golf Australia, the EGA, and CONGU. GA has invested heavily in the Worldwide Handicap System process and we have been very pleased to be able to lend our expertise as an international leader on handicapping. The GA Board looks forward to receiving the final proposal on the make-up of the Worldwide System. We are mindful of the amount of handicapping change that has occurred in Australia in recent times. We also believe that the Worldwide System is likely to provide the flexibility to ensure there would be only minimal (if any) further adjustment required for Australian clubs and golfers. Net competitions are more important to the culture of Australian clubs than they are to the club culture in any other country. This is a proud feature of Australian golf. The GA Board is committed to ensuring that the handicap system in use in Australia provides the best possible service for our clubs and golfers. Should you have any queries on either of the above items, please contact GA’s Rules & Handicapping Director, Simon Magdulski (simonm@golf.org.au). I am writing to advise you of two surveys being conducted on pace of play. Firstly, The R&A is conducting a global survey of individual golfers. This is now live and can be viewed on the following webpage – http://ow.ly/Cp0tA. Secondly, in the coming weeks Golf Australia will build on the work of The R&A and open a survey of Australian club administrations. These two pieces of research are being conducted with a view to determining: the true extent of the issue, an understanding of all of the causes, the degree of importance the industry attaches to trying to improve pace of play, and what the most effective strategies will be. We believe the survey of individual golfers will deliver a comprehensive understanding of the views and preferences of golfers (or customers), whilst the club survey (ie the survey of the service providers) will detail the impacts on club businesses and golf operations as well as to provide an appreciation for what strategies are effective in practice and are considered to be realistic for club administrators to implement in the real world. The R&A’s survey of individual golfer views and attitudes on pace of play is open to all golfers in every country. In Australia, we will promote The R&A survey to the entire GOLF Link database of golfers. This will be done via email which will be sent this Friday (10 October). In addition, we would be very grateful if you can help us to assist The R&A by promoting this survey directly to your membership. For the GA survey of Australian clubs, access details will be provided to club administrators in the coming weeks. We have commissioned Jeff Blunden to manage the GA club survey and reporting. Many thanks for whatever assistance you can provide in promoting The R&A survey to your club members (http://ow.ly/Cp0tA). We would also encourage you to do The R&A survey yourself and provide your own individual views through it. please click HERE for the results both from the Closing Day event held at Shortland Waters Golf Club, and the Annual Trophies for 2013 Congratulations to all of the recipients. With 2013 being our 50th Anniversary year, we were gratified to be patronised by 100 starters, including 8 sponsor's and members' guests which must be some kind of record. Once again we were lucky with the weather, and after a very brief shower before our start, pleasant conditions assured all of a most enjoyable round of golf. A feature of the day was the quick pace of play, with times well under 4 hours being recorded, and the whole field completed in a little less than 4.5 hrs. The presentation during dinner of both the day's prizes and the annual trophies was a lively affair, but the highlight of the event was the interview segment "When Men become Boys" hosted by MC Mike Rabbitt during which the Club's founding Captain Reg Parker, Secretary John Pickles and long time stalwarts Barry Barrett and Bill Collins shared reminiscences with the assembled guests. Our thanks again to the many former members who were able to share this milestone event with us, and to NBN and Mike Rabbitt for the very generous donation of his time. The meal by Shortland Waters Grill was generous and most enjoyable, as were the wines provided once again by IronBark Hill. President Gary conveyed on behalf of the whole membership our gratitude to the loyal sponsors who support the club throughout the year, both on and off the course. All members and their guests are advised that they should be around in January for our Opening Day (top 32 to qualify for the Airview Aluminium Singles KO) on the 20th at Waratah. We've maintained the program at 12 games. There will be an email with the details.....or consult the website.....HERE. Thanks to you the members and sponsors for turning out in such positive numbers during 2013, to make the year yet another success. I trust everyone has enjoyed a safe and happy Christmas, and I wish you all health and prosperity in the New Year. it has been determined by the committee that former N MBA GC members attending the 50th Anniversary Golf Day will be accorded Honorary Membership for the event, and be charged at the normal member rate of $60. Please feel welcome to register for this event in any combination of players, i.e. as a single player, a pair, or as a full team, all equally acceptable. Final teams will be determined by the match committee. Members are reminded that the appropriate method of nomination is through the web based form, which can be found HERE. Other forms of registration, either by phone, voicemail, text or email, may not reach the intended recipient. Subject: Congratulations to Bobby Roberts !!! Sad news with the recent passing of John Jolley, father of club members Chris and Ken, and grandfather to Benn. John enjoyed a long and active life, and has left with his boys a love of cricket and golf. Our thoughts are with the Jolley family at this sorrowful time. please click HERE for the results from Wednesday's MGA Insurance Brokers sponsored Golf Day at Hawks Nest Golf Club. The field was comprised of 62 starters, including 11 members' or sponsor's guests, with two guests, Ron Armstrong and Geoff Barnett, signing up as new members. A convivial coach trip up was followed by an earlier than schedued start. It was an ideal day for golf ~ overcast and cool, windless, dry but for a few drops and ultimately sunny ~ on a course obviously benefitting from a natural sand-based drainage system. Scoring at this event was modest, with daylight between John McLaughlin's 38 points and the rest of the field. Particularly pleasing was that our large field again managed to finish in time for dinner. Fortunately lunch maintained its former high standard. Dinner was as enjoyable as ever, with nearly the whole field remaining to partake in the presentation and the IronBark Hill dinner wines. A complimentary drink and finger food will be served at the meeting. 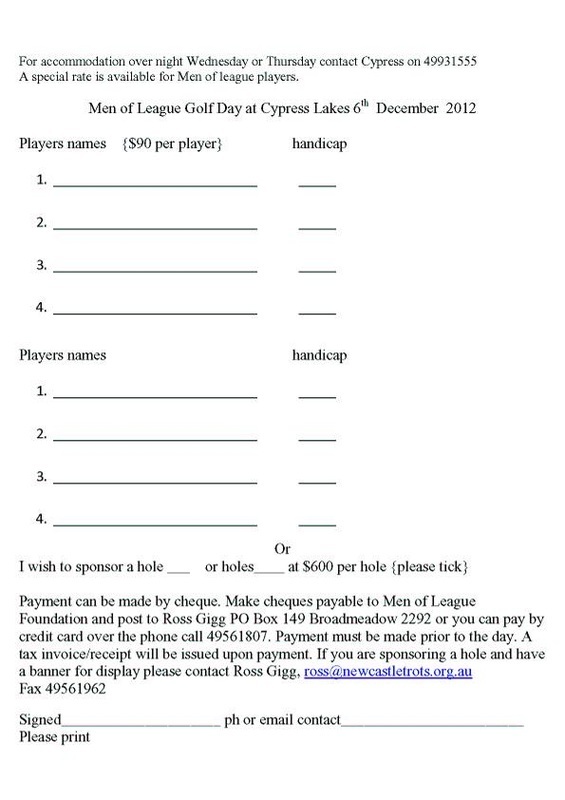 click HERE to read the Notice for next month's golf day @ Hawks Nest Golf Club. Be advised that this day is an Individual Stableford event, and will be conducted over two grades, commencing from two tees from 10:00 am. Eligible players (those with GolfLink handicaps) will also be playing in the Hawks Nest GC Individual Stableford and 2BBB competitions. To be contested as well are the semi-finals of the Air View Aluminium Singles Knockout. Participants should consult with their opponents and sort out cart hire and tee groupings before registration. A coach will depart from the International Sports Centre carpark at 8:00 am. Seating will be limited to those who book first. A light lunch will be provided at the club at half-way. Dinner will be in the clubhouse at approximately 5:00 pm, with the coach returning from Hawks Nest at 6:30 pm. Thanks goes to our regular sponsors Ross Lewis MGA Insurance Brokers, along with Steve Denning at Hawks Nest Golf Course ProShop, IronBark Hill Wines, Hanson Concrete and Hunter Star Mercedes. Naming rights sponsorship for the day is still up for grabs, and any member or organisation interested in this high profile event should contact President Gary asap. Members may wish to check out all of the sponsors' websites by following the above links (blue text, underlined, OR clicking on their logo) in the notice. A policy was adopted that premium golf day fees are an all inclusive offer to our members and guests, as prices are negotiated in advance on a notified attendance level, and are generally well subsidised by the club. This will encourage members to take full advantage of the whole of the days’ activities and is consistent with the club’s stated aim of encouraging participation and networking between the members of the club. It was determined that this policy should be adequately publicised to the membership to avoid misunderstanding at any future events. Consequently, no discount is offered should you not utilise the coach provided, or attend the dinner. Cart hire is up to the individual. To avoid disappointment, it is considered prudent to book carts in advance with Steve or Eddie at the Pro Shop (ph. 02 4997 0740). congratulations to the winners at Wednesday's Golf Day at Morisset, sponsored by Newcastle Permanent and incorporating the quarter-finals of the Air View Aluminium Singles Knock Out. Full results can be found on the club's website by clicking your mouse here. Happy snaps by Arja (compliments of Dave's Golf Shop) can be found here. The field was comprised of 66 contestants, including 11 sponsors' representatives and guests. Conditions were sunny, clear and mild, but wet underfoot. Fortunately carts were permitted after the recent heavy rains. With a few outstanding exceptions, the generally modest scores were indicative of the challenging playing conditions. The greens at Morisset are always deserving of mention....look like carpet, play like lino...although not quite as fast as in the past. John McLaughlin, deprived of a place in the major prizes on countback, was compensated with the Members Name Draw prize, jackpotted to $200....thanks again to sponsor Australian Truck & Bus Finance for this exciting innovation...remember, it pays to stay for the presentation. A reminder that our prize vouchers are redeemable at IronBark Hill Vineyard, where they benefit from a hefty member's discount and that they are otherwise valid ONLY at the clubs and/or the proshops on the Club's playing calendar (all of whom are active sponsors of our NTP events). Consult your program card, or check HERE before asking at your local club. Refusal can be embarassing, both for the member and for the former sponsor. 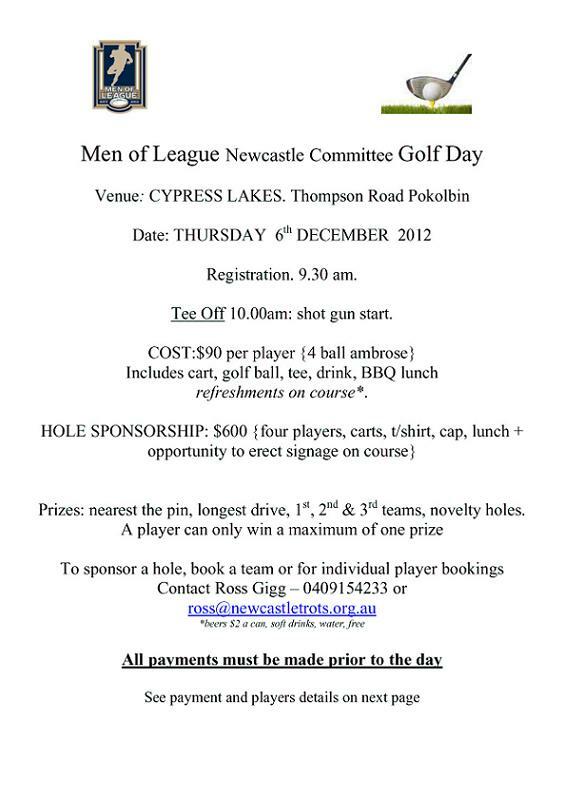 Please click HERE for the Notice for next month's golf day @ Morisset Country Club. Be advised that this day is an individual stableford event, and will be conducted over 2 grades. The quarter finals of the Air View Aluminium Singles Knockout will be held in conjunction. Thank you to Newcastle Perm as major sponsors on the day. Acknowledgement also to Dave's Golf Shop for our NTP prizes and minor prize sponsors Ross Lewis MGA Insurance Brokers, IronBark Hill, Hanson Concrete and Hunter Star Mercedes. Members may wish to check out all of the sponsors websites by following the links (blue text, underlined, OR clicking on their logo) in the notice. Cart hire is up to the individual. To avoid disappointment, it is considered prudent to book carts in advance (at MCC member rate of $30) with Dave or Arja at the Pro Shop (ph. 02 4973 2455). Be advised that the sponsor is providing bacon and egg rolls between 9:00 and 10:15am, so timely arrival and registration is encouraged. please click HERE for the results from yesterday's first round of the Club Championships at Pacific Dunes, sponsored by VBD Chartered Accountants . The field was comprised of 63 contestants, including 4 members' guests, 3 sponsor's guests and 4 visitors from NSW MB & E, Lynn Astley, Rod Wheatley, Reynold Sciuriaga and his guest Peter Hale. Thanks for making the trip up, along with our regular Sydney based member, Don Eagar. The weather was absolutely perfect, and the course as usual was in great shape, although the greens seemed a little quick for many. The scores were indicative of the challenge presented by this iconic golf course, with only one sub par net score. Special mention once again of the staff at Pacific Dunes, particularly Jodie Ireland and Kurt Linde, for their generous and professional assistance in organising a very enjoyable golfing experience. The membership was once again graced by a rare cool weather appearance by immediate past President Warren Deane, along with other first time (in 2013) appearances by members Greg Dawson, Ron Laing and new member Ian Player. Additional thanks to Scott and the girls from VBD for their generous contribution to our 2013 Charity efforts in support of disadvantaged children in the Hunter, by conducting an innovative NTP comp for 2 iPad Minis, won by dead-eye Kevin Woodcock and dead-lucky George Bannerman. Looking forward to Newcastle Permanent's event at Morisset on Wednesday 5th June......next round of the Airview Aluminium Singles Knockout. Be advised that the Australian Truck & Bus Finance P/L sponsored Members' Name Draw prize of $200 cash went unclaimed, with 3 unlucky members drawn and not present. This jackpots to $200 for the next draw..
Also on the website is an update on the Annual Points Score and Aggregate Stableford competitions. 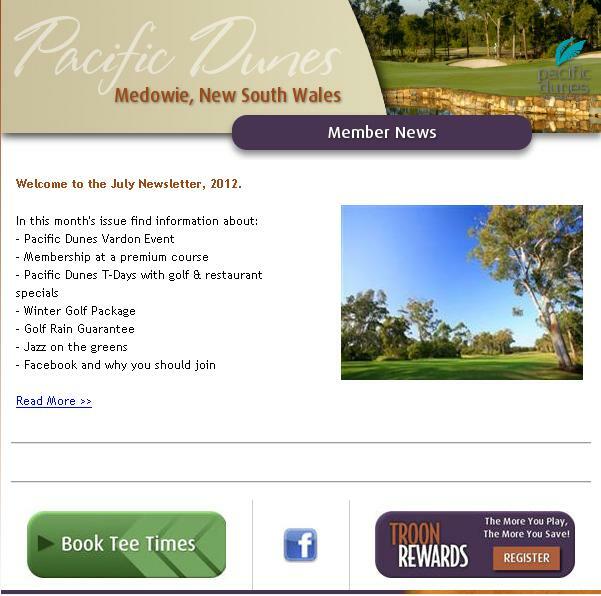 Please click HERE for the Notice for Thursday 9th May's first round of the Club Championship @ Pacific Dunes Golf Club. Be advised that this is an individual stroke event, and is to be played in 3 grades. Newcastle Permanent, loyal supporter of this event for quite some time, has determined to refocus their sponsorship and will be represented at Morisset, as well as The Vintage later in the calendar. VBD Chartered Accountants has generously sponsored this next event. Our thanks goes to member Scott Norrish (VBD Director), who also acts as our Honorary Auditor. In addition, the club owes thanks to Pacific Dunes Golf Shop for the NTP prizes and Hanson Concrete, Hunter Star Mercedes, IronBark Hill Wines and MGA Insurance for the other minor prizes. Members should ensure they check out all of the sponsors' websites by following the links (blue text, underlined, OR clicking on their logo) in the notice. Shared motorised cart hire is included in the cost of the day. No booking is necessary. Bacon & Egg rolls (sponsored by your club) are available before play. A food and drinks cart will be available on the course, at members' own cost. Cart and Tee allocations, as well as Competition Card preparation, are all dependent upon accurate registrations. Should a member, after registering for play, find themselves unable to attend, it is their responsibility to advise their partner, endeavour to secure a replacement and have the registration sheet altered. should you wish to participate in Hornibrook in Sydney in October, and have not already registered, please do so as soon as possible. The predicted limitation of starters to 144 has been confirmed. Final numbers are now being called for/allocated by the NSW MB & E organisers. Pleased be advised that each individual must register. Room-mate registration does not constitute a valid registration (see greyed out names, above). Please read form filling instructions on the website carefully. A couple of forms have been emailed in blank, and these don't count either. I have it on good authority that the field for this year's Hornibrook may be limited to 144 players, in order to guarantee a single shotgun start and so reduce costs and organisational requirements. Whilst this augurs well for the future of the event, it has potential impact on the larger teams, Newcastle included, if teams are legislated to 20 entrants per state/region. In the past, such imbalance has been addressed by the re-distribution of unused quota from the smaller teams. The wisdom is that at least in 2013, it will be a matter of first in - first served. To that end, please find provided HERE a link to the fully interactive 2013 Invitation & Registration Form, from the national MBA website. If you intend participating in Sydney at this year's tournament, you are encouraged to complete and submit your application as soon as possible. These I intend remitting to the organisers from 1 March onwards. Payment will not be necessary until the issue of invoices, which will be in late June. A Dress Code applies at Pacific Dunes. please click HERE to check the results from today's Golf Day at Toronto, sponsored by Reoweld P/L and incorporating the second elimination round of the Air View Aluminium Singles Knock Out. The remaining 8 K/O competitors should be aware that their next match may be played, by mutual consent, at any venue, on any date up until the next scheduled round at Morisset on 5th June. The field today was comprised of 58 contestants, with 4 members' guests and 4 sponsor's representatives or guests. Weather was very much as predicted this morning, with early showers clearing to an ideal, sometimes sunny day of golf. The course was well presented, the highlight being the excellent condition of the greens. Encouraging also was the very high number of competitors who stayed on for the presentation, which was completed by just after 4pm. Be advised that, again, the Australian Truck & Bus Finance sponsored Members' Name Draw is valued at $100...happy winner ($200) Colin Penfold....so make sure you're in it....and remember, to qualify you must still be present at the draw. please click HERE to find the results from yesterday's Golf Day at Charlestown, sponsored by Rovert Lighting & Electrical P/L and incorporating the first elimination round of the Air View Aluminium Singles Knock Out. The remaining 16 K/O competitors should be aware that their next match may be played, by mutual consent, at any venue, on any date up until the next scheduled round at Toronto on 16th April. Yesterday's field was comprised of 42 contestants, with 0 members' guests and 4 visitors from the sponsor. This is an unprecedented low attendance which begs the question WHY ? If you're one of the 80 odd members who didn't attend, it would be appreciated if you could let us know your reasons, via the website feedback form . This will hopefully improve service to the membership in the future. Weather was again ideal, we've certainly been blessed in 2013. Charlestown GC's management, proshop and catering staff are to be commended for their excellent standard of service, hospitality and organisation. Unfortunately the ground staff didn't appreciate that when we ask for white tees, we don't mean white tees within 2 metres of the normal yellow tee positions. As our results now (through submission to GolfLink) reflect in our weekly home club comps, the expectation is for a genuine and realistic challenge. Be advised that the Australian Truck & Bus Finance sponsored Members' Name Draw has jackpotted to $200....so make sure you're in it....and remember, to qualify you must still be present at the draw. Also availalble on the website is an update on the yearly Points Score. This competition in 2013 presents a valuable sponsorship opportunity for YOUR business, providing as it does regular and popular exposure every month. So too does our Aggregate Stableford competition. Expressions of interest should reach President Gary Sheppard ASAP. Should a member, after registering for play, find themselves unable to attend, it is their responsibility to advise their partner(s), endeavour to secure a replacement and have the registration sheet altered. order sandwiches for pick up @ lunchtime. must be present at the event to claim prize. must be present at the draw to claim prize. $100 cash to jackpot each month until claimed. Closing Day draw to be continuous, until an attendant winner is found. A reminder that Monday's event is the first knock-out round for the Airview Aluminium Singles Knock-out competition. It is also the third round of the Annual Points Score, and the Averaged Aggregate Stableford competition. please click here for the results from Wednesday's 35th Annual Newcastle vs. Sydney Challenge at The Springs, sponsored by Smith & Sons in partnership with Beaumont Tiles, Bunnings Trade Centres, Innovative Timber Ideas & Winnings Appliances Commercial Division. Our sponsors' generosity is all that enables us to present a very cost effective golf experience to our participating members. Please visit their websites by clicking on their LOGOS on our RESULTS pages, and if you like what you see, make sure you let them know how you found them. The field was down a dozen on last year, being comprised of 21 Sydney challengers and visitors, 53 Newcastle members, 6 Newcastle visitors and 9 sponsors' representatives and guests. The weather was ideal, sunny but humid, relieved by a moderate wind, in yet another fortunate break in the current run of rainy days. The course, off the blue markers, proved to be a genuine test of golf, as evinced by the average score of just under 26 Stableford points. Only four players equalled or bettered par. Congratulations to the team from Newcastle who held out (4 to 4) a strategically selected NSW contingent, and so retained THE CUP, which made its first public appearance in living memory. Mention must also be made of visitor Brett Angus whose 43 points (off a handicap of 23) were obviously scored on a different course to the rest of the field. Speed of play was also satisfactory, with the fastest group finished in a little over four hours, and most of the field in well under five. Dinner this year was again a BBQ Buffet affair, which was exceptionally well received. As we have come to expect, a lively presentation ensued, with NSW MB & E Captain Merv Cross his usual entertaining self, followed by an equally eloquent Tony Brown. The consensus view is that The Springs is an outstanding golfing venue with an enthusiastic and professional team providing a memorable golf and dinner experience ~ sufficient to warrant nomination as the permanent venue for our annual challenge. Please note that 2013 Membership Subscriptions were due on the 1st February, and must be paid to be eligible for competitions. Please notify me (email preferred) if you require a Tax Invoice/Receipt. Banking Details for Direct Deposit are ... Newcastle MBA Golf Club.... BSB 012~770 .... A/C # 2059 09218. and quote the Tax Invoice number (if you have one) or your name as the reference. Looking forward to Rovert Lighting & Electrical Pty Ltd's day at Charlestown on Monday 25th March......1st round of the Airview Aluminium Singles Knock-out.....the DRAW for which can also be found at the RESULTS link above.. It is with regret that I inform you of the recent death of one of our better known past members, Wal Pinfold. Wal was a former Newcastle MBA President and a long time golf club supporter. A Funeral Service will be held for Wal at 11am tomorrow at the Merewether Central Uniting Church, Glebe Road Merewether. The club will be represented by immediate past President Warren Deane. Loving husband of JUNE (decd). Much loved father and father-in-law of GEOFF and ROS PINFOLD, ROS and MICHAEL GIANACAS. Dearly loved pa of ANGELA and TODD, SARAH and SCOTT, DUNCAN, SHANNON and RACHEL, CHRISTOPHER, LOUISA and MICHAEL. Great pa of ARCHIE, MIMI, LUCY, SAMMY, LACHLAN, ALICE and BONNIE. Much loved brother of WARREN and VAL (decd), and ALAN (decd). Sadly missed by their FAMILIES. Relatives and Friends are invited to attend WALs Funeral Service to be held in the Merewether Central Uniting Church, Glebe Road, Merewether on WEDNESDAY, 27th February 2013 commencing at 11am. A private cremation will follow. In lieu of flowers, donations in WALs memory to the Macular Disease Foundation may be made at the Service. Sad news with the recent passing of David Sheppard, father of club president Gary. Our thoughts are with Gary and his family at this sorrowful time. please click here for the results from yesterday's Opening Day at Waratah Golf Club, sponsored by MGA Insurance Brokers. Our thanks goes to manager Ross Lewis for continuing his support in 2013. The day was a strong members' event with 57 members (including 3 new recruits) in the field of 61, although down a little on the good attendances we have come to expect. Please note that 2013 Membership Subscriptions ($50 normal, $550 Corporate) were due on the 1st January, and must be paid to be eligible for competitions. Please notify me (email preferred) if you require a Tax Invoice/Receipt. Another renewing sponsor in 2013 is Hanson Concrete, represented by club member Nathan Branz. Hanson are providing prizes for the Drive-at-Target competition, which are awarded to the drives (A & B grade) finishing closest to the target (on the fairway)...... not necessarily for actually hitting it !! Regrettably a number of former sponsors have not renewed in 2013. We are very grateful for their support, in many cases over many years, and wish them every success in the future. This leaves our budget somewhat challenged. On the bright side, it has opened a number of opportunities for new and aspiring sponsors, from entry level through to using our event as a vehicle for your own corporate event. Please contact Gary Sheppard should you desire more information. A proposed event (for members only) is the Bird's Nest prize, which is a pot of golf balls awarded to the NTP winner whose ball rests less than 50cm from the hole. This will jackpot at the rate of 3 golf balls per event, until it is claimed. We are currently looking for a sponsor for this monthly event. Please contact Gary as above with your offers. I take this opportunity, having survived the festive season once again, to wish you all good health and fortune for the whole of 2013 and look forward to seeing you at the NSW-v-Newcastle MBA Cup Challenge at The Springs on Wednesday 27th February. Do not miss this little known gem of a golf course !!! please find below the list of players so far registered for Monday week's MGA Insurance Brokers sponsored Opening Day at Waratah Golf Club. Nominations are currently short of the 80 starters required by Waratah GC to qualify for our preferred shotgun start, and members are encouraged to remind their colleagues or invite a friend to help make up the necessary numbers. Finger food and Happy hour at the end of play !!! Members are reminded that this event is also the QUALIFYING ROUND for the Airview Aluminium Singles Knock-out Competition, with the top 32 players to progress to the next round. All of the knock-out rounds are detailed on the Annual Program. Players who know they will be unavailable for subsequent rounds are requested to mark their cards as ineligible, in order to enable full and fair allocation of the seeds. .....on the Registration Form to be found here. Event registrations and apologies should be submitted through the appropriate website forms. Your assistance is appreciated. Newcastle MBA Golf Club is now also on facebook. Members may prefer to access our information through this portal. I am a facebook novice and welcome any guidance or assistance in the management of this facility. 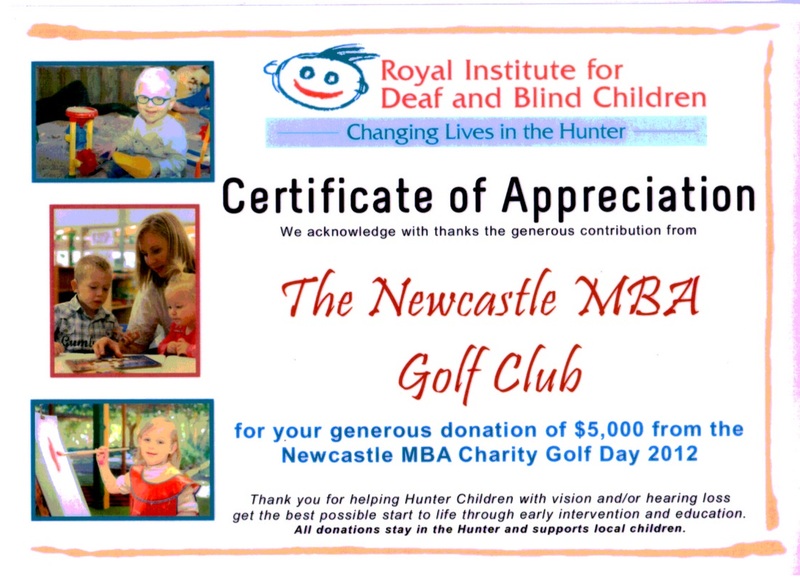 welcome to another golfing year with Newcastle MBA Golf Club. Please click HERE for the Notice of Monday 21st January's Opening Day golf @ Waratah Golf Club. Be advised that this is a Stableford event, to be conducted over 2 grades. It is also the Qualifying Round for the Airview Aluminium Singles Knock Out Competition, with the top 32 players to qualify, so be sure not to miss it. Thanks goes to MGA Insurance Brokers as major sponsors on the day, to Waratah Golf Club Pro-Shop, coming on board with the NTP prizes; as well as to prize sponsors IronBark Hill Wines, Ross Lewis MGA Insurance Brokers, Hanson Concrete and Hunter Star Mercedes. Members will be pleased that Bill Pitt and Australian Truck & Bus Financial Services P/L are again in 2013 providing a $100 monthly Members Draw prize, and should ensure they check out all of the sponsors' websites by following the links (blue text, underlined, OR clicking on their logo) in the notice. Cart hire is up to the individual. To avoid disappointment, it is considered prudent to book carts in advance with Scott or Grant at the Pro Shop (ph. 02 4958 3558). Also on the website is the Events Calendar for 2013, sponsored this year by Hunter Valley Granite & Marble. A reminder that Annual Fees ($50 individual, $550 Corporate) are due at or before registration on Opening Day. Members must be financial in order to qualify for any competition. please click HERE for the results both from last Thursday's Closing Day event held at Shortland Waters Golf Club, and the Annual Trophies for 2012. Congratulations to all of the recipients. With 70 starters, including 8 sponsor's and members' guests, attendance was similar to last year's improved numbers. Once again we got lucky with the weather, and perfect conditions assured all of a most enjoyable round of golf. The Shortland Waters course has again benefitted from recent alternating rains and sunshine, with the course in good shape, and the greens, although a little slow, looking as good as I can recall. The presentation during dinner of both the day's prizes and the annual trophies was a lively affair, one highlight of which was the presentation of Life Member Certificates to 2012 inductees Barry Barrett and Kevin Woodcock. The meal by Shortland Waters Grill was generous and most enjoyable, as were the wines provided once again by IronBark Hill. President Gary conveyed on behalf of the whole membership our gratitude to the loyal sponsors who support the club throughout the year, both on and off the course. 2013 is the club's 50th year. All members and their guests be advised that they should be around in January for our Opening Day (top 32 to qualify for the Airview Aluminium Singles KO) on the 21st at Waratah. We've maintained the program at 12 games. There will be an email with the details.....or consult the website.....HERE. Thanks to you the members and sponsors for turning out in such positive numbers during 2012, to make the year yet another success. Everyone have a safe and happy Christmas, and I wish you all health and prosperity in the New Year. Master Builders would like to remind you that we have the Hunter Region Builders & Contractors Expo this Thursday, 18 October 2012. With your business being a part of the building and construction industry, the MBA Expo is tailor made for you! It's packed full of free education, networking opportunities and exhibitors that are all designed to help you manage your business better. With over 60 exhibitors, the Expo is a superior showcase of products and services to the building industry. An additional break out session has been added to the schedule! At 3.30pm you can find out all your needs for further your qualifications through career pathways from the MBA Training Department. For further information on the breakout sessions, please click here. You can also earn 2 CPD points for 2 hours attendance - at no cost to you! Name of Guest 2: / Licence No. (for CPD): The positions expressed by the presenters, who are not Association employees, are their own. The Association does not endorse or adopt positions made by independent presenters. Remember, you have to be both present and financial to win it, so click HERE now to register for Muree, Round 2 of the Club Championships. please click HERE to read the Notice for this month's golf day @ Muree Golf Club. Be advised that this day, as Round 2 of the Club Championship, is a stroke event, and will be conducted over 3 grades, commencing from two tees from 10:30 am. Welcome once again to The Nova Group as major sponsors on the day, as well as to the Muree Golf Club ProShop, coming on board with our NTP prizes; also Australian Truck & Bus Finances; Hunter Star Mercedes; IronBark Hill Wines and Ross Lewis MGA Insurance Brokers. Members may wish to check out all of the sponsors websites by following the links (blue text, underlined, OR clicking on their logo) in the notice. Cart hire is up to the individual. To avoid disappointment, it is considered prudent to book carts in advance through the pro shop (ph. 4987 2978.....Nathan Goodchild). A light lunch is included in the cost of the day. Players are discouraged from lingering over lunch, in order to ensure a timely finish. Members are expected to familiarise themselves with the requirements of behaviour, mobile telephone and dress regulations of the golf clubs that we are privileged to attend. Members shall act with dignity at all times and observe both the rules and etiquette of the game of golf. To facilitate this outcome, consumption of alcohol on the course during play is discouraged, and any behaviour bringing the club into disrepute will be referred to the Committee for appropriate action. please click HERE for the results from today's Terry Keelan Plumbing P/L / NHS Plasterboard & Timber co-sponsored Golf Day at Merewether Golf Club. The field was comprised of 77 contestants, including 35 members' or sponsors' guests who made up for a surprising number of absentee members. A number of our other sponsors were also represented, including Bass Floor Co, Hunter Star Motors, IronBark Hill Wines, MGA Insurance Brokers, Newcastle Perm and Nova Showerscreens & Wardrobes. 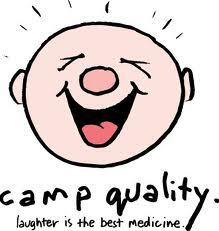 This event was also a Charity Benefit for RIDBC & Camp Quality and succeeded in raising a significant amount for the Hunter's unwell or disadvantaged kids. Full details and acknowledgements will be published after a final accounting. Donations can still be made by clicking HERE. Congratulations goes to The Builders, who, in spite of The Architects being supported by a superior number of academics, engineers, subcontractors, suppliers and surveyors, reversed last year's aberrant result with a convincing 8 to 5 victory. Thanks to Mark Abrahams, Daniel Bush and Joel Chamberlain from Suters who attended on behalf of their profession, once again seriously underrepresented. Many of us have a commitment to a favoured charity, and we all have our own way of showing it. 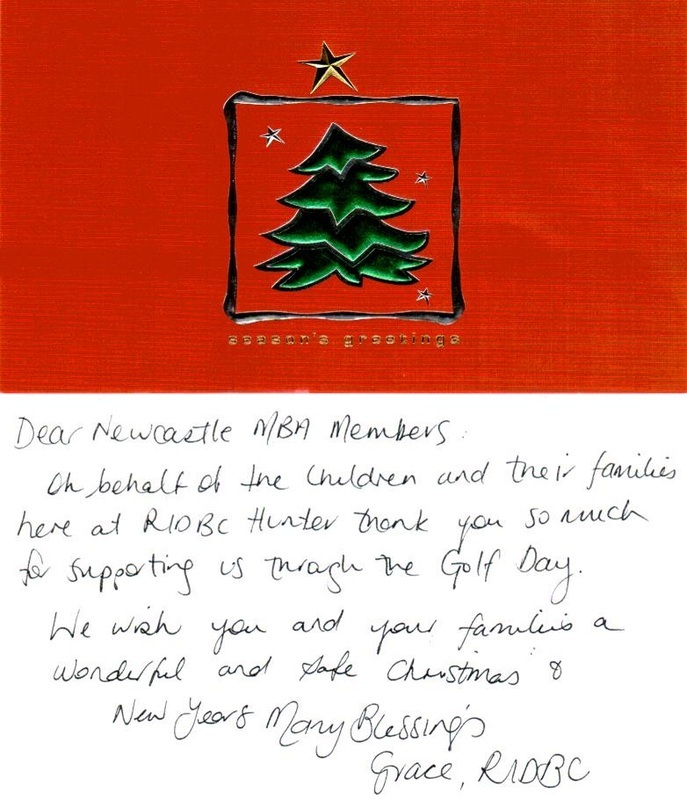 N MBA GC members recently supported RIDBC & Camp Quality at the Charity Golf day @ Merewether. Member Mark Wyborn was unable to attend the golf, but made a generous contribution to our prize & auction pool anyway. In the face of much competition for the donation dollar, it is said that charity begins at home, and one good turn deserves another. Not only has Mark supported RIDBC & Camp Quality, but he is about to lay his body on the line in support of his favoured charity, "Live for Kids", undertaking a gruelling 2 day bicycle ride from Port Macquarie to Newcastle. Newcastle MBA Golf Club has pledged $100 in support of Mark's efforts, and the committee encourages our members and sponsors to make whatever contribution they are able. Donation is easy, just click here and follow the prompts. Everyone who knows Mark calls him "Wacky" (very old nick name). Mark is married to Kelly, with two sons Zac 14, and Ben 9, and has played competitive sports all his life, including Rugby League, competition squash, and cycling. He started cycling after his footy finished as he needed to find something else to do. He also enjoys the odd round of golf. The reason Mark is completing the ride is that his son Ben was presented with a bike from Live for Kids recently and he thought that putting himself through two days of pain was the least he could do. As he only decided to ride three weeks out from the event, his training will be limited but thinking of Ben riding with him, as family will get him home. Details of the Live for Kids Cycle Classic can be found here. please be advised that the Annual General Meeting was successfully conducted at 5:00pm on Monday 6th August, at Newcastle Golf Club, and was attended by 44 members. Newcastle Golf Club achieved their usual high standard as hosts with outstanding accompanying finger food, much appreciated by all. The highlight of the meeting was the induction by unanimous acclaim of long term club stalwarts Barry Barrett and Kevin Woodcock as Life Members of the club. Our congratulations to these gentlemen, whose outstanding support of our Hornibrook Tournaments for nearly 40 years and their contributions to the club as Committeeman and Vice Captain make them each a standout for this recognition. A copy of the AGM Minutes and attached Financial Reports can be located by clicking HERE. The players enjoyed an ideal day for golf ~ cool, sunny, breezy and dry ~ on a course in excellent condition. Scoring however turned out to be difficult, made moreso by the slickness of the greens. A modest 34 points was sufficient to get into the money. The Airview Aluminium Singles Knockout was completed in a tight tussle between Barry Fox and Chris Jolley, who prevailed over Barry on the 19th hole after forcing a sudden death playoff. Be advised that the Australian Truck & Bus Finance sponsored Members' Name Draw is now valued at $200...unhappily for the three absent members whose names were drawn by sponsor's representative Bill Pitt....it pays to be there....and remember, to qualify you must still be present at the draw. A wine raffle of 8 mixed IronBark Hill wines reminded us that our next event is the CHARITY GOLF DAY in support of the Hunter's disadvantaged kids. This will be in conjunction with the annual Builders -v- Architects 3-man ambrose challenge. We are looking for donations, auction items and raffle prizes in support of this worthwhile cause, and request any members able to assist in this to contact me ASAP. Any contributions are most appreciated, no donation too small. Member Terry Keelan (Plumbing Pty Ltd) has kicked off the effort by co-sponsoring the day and dinner (along with NHS Plasterboard & Timber). Full list of winners is attached on left. Balls will be available for pick up at Newcastle in two weeks. It is with regret that I inform you of the death of one of our past members, John Earp, after a long illness. John was a long time club stalwart and played with us until the the early 2000's. A Memorial Service will be held at 12 noon tomorrow, at Christchurch Cathedral. The club will be represented by immediate past President Warren Deane. Dearly loved husband of ROSLYN, much loved father and father-in-law of MICHAEL and JUDY, RICHARD and SALLY, DAVID and ANNA, ANDREW and CHELSEA. Loving grandfather of their FAMILIES. Loved brother of ANTHONY, brother-in-law and uncle of MARGARET and COLIN DENT, ROBERT and JUDY MITCHELL, and their FAMILIES. Relatives and Friends are warmly invited to attend a Memorial Service in memory of JOHN, to be held in Christ Church Cathedral, Church St Newcastle, on THURSDAY 7/6/12, commencing at 12noon. In May 2011, GA provided to the industry a plan for the development and implementation of the new GA Handicap System. Included in this plan was a note advising that GA intended to post on its website at the end of November 2011 a document detailing the proposed system. The implementation plan also noted that this proposal would be formally considered by the GA Board early in 2012. GA ultimately decided against posting a document on the GA website in November 2011. This was partly to enable any announcement to include the outcome of an extensive statistical analysis. GA is currently working with GOLF Link on the potential software implications of the new regulations. A communication announcing the contents of the complete new GA Handicap System is scheduled to be released on Friday 1 June. View the communication from the Chairman of Golf Australia dated 1 June 2012.